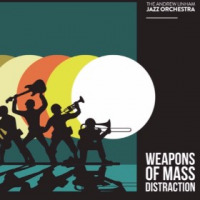 Composer, saxophonist and bandleader Andrew Linham debuts his 17-piece Jazz Orchestra on Weapons Of Mass Distraction. "Jazz Orchestra" can be a warning sign of po-faced and serious "art" up ahead, but no such worries here. This is a Big Band in the best, big sound, big fun, sense of the phrase, performing 11 of Linham's compositions with all the energy and talent required to do them justice. Linham clearly enjoys inventing tune titles -each one seems to have a story behind it, whatever those stories might be. Great titles do not necessarily make great tunes, but its pleasing to report that in this case the two go together beautifully. Every one of the 11 tunes has a charm of its own, whether it echoes the great big bands of the '30s, the funky ones of the '70s or the rock-inspired ones of the late-60s. "Dinosaur Face" opens with Tom Millar's gently-swinging piano and Dave Ingamells' relaxed brushes as the horns gradually build in intensity. Despite the title, it's a rather romantic tune, more suited to dancing close and slow than running hell for leather from a pack of velociraptors (although it does get more dramatic and dark in its closing third). "Pyrrhic Victory" is another deceptive title, disguising an up-tempo number full of drive and energy (and Tommy Andrews' clarinet, giving it a '30s swing flavor). The review copy of the CD arrived with a cryptic note from Linham"Watch out for Big Bertha." She arrives on "Big Bertha's Quarter To Twos," whose clip-clop rhythm underpins a raucous few solos from Linham (his first of the album), Riley Stone-Lonergan, Chris Saunders and Andrews. Rich Perks' funky guitar drives "Apples Aren't The Only Fruit"possibly the only TV cop drama theme that's inspired by a Jeanette Winterson novel. Winner of the Best Tune Title Of The Entire Album Award? "Henchmen Live The Shortest Lives." It's the only tune on the album that comes close to melancholy, Miguel Gorodi's plaintive trumpet deserving the lion's share of the credit for setting the mood: a valediction for all those henchmen who failed to head Linham's warning. The band gets into full-on last-dance-of-the-night mode for the closing number, "I Remember Fenton" (Shane Fenton, aka Alvin Stardust? Or Fenton the labrador, the scourge of Richmond Park?). And so it's "Goodbye" from the Andrew Linham Jazz Orchestra. Until next time, one hopes. Track Listing: Screaming Ab Dabs; Sharking In The Chalet; I Arksque This; Dinosaur Face; Pyrrhic Victory; Big Bertha’s Quarter To Twos; Apples Aren’t The Only Fruit; Don’t Mention Janet; Henchmen Live The Shortest Lives; Waitress Winking; I Remember Fenton. Personnel: Andrew Linham: saxophone; Tommy Andrews: saxophone, clarinet; Phil Meadows: saxophone; Riley Stone-Lonergan: saxophone; Jonny Chung: saxophone; Barney Lowe: trumpet; Miguel Gorodi: trumpet; Sam Warner: trumpet; Matt Roberts: trumpet; Andy Hall: trumpet; Rosie Turton: trombone; Tom Green: trombone; Chris Saunders: trombone; Barney Medland: trombone; Tom Millar: piano; Rich Perks: guitar; Andrew Robb: bass; Dave Ingamells: drums.